Tender story of heartbreak, healing, and faith (Mickelle Book 1, Rebekka Book 1)"Not your typical romance. 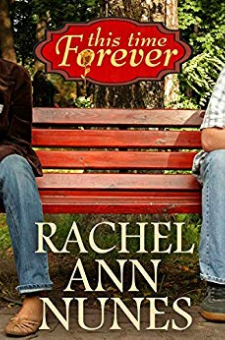 This Time Forever has the feel of a family saga, with two completely satisfying romances that interweave beautifully to create a whole. I look forward to other books by this author." –Romance is BestBook DescriptionMickelle Hansen never realized marriage could be so challenging. Her husband's epilepsy has caused him to become cynical and verbally abusive, but with love in her heart and strength from her Heavenly Father, Mickelle is determined to make her marriage work. Then the worst happens. Can she ever pick up the shattered pieces of her life? Meanwhile, Rebekka Massoni arrives in America to work for handsome widower Damon Wolfe, leaving all her hopes and dreams back in her beloved France. She has loved and idolized Marc Perrault since she was five years old, but he can offer only her friendship in return. Can Rebekka forget Marc and learn to love another man? Both Damon and Samuel Bjornenburg, successful CEO of Corban International, hope to win a place in her heart, but Damon's daughter doesn't like Rebekka, and Samuel doesn't share her faith. To make matters worse, Rebekka's heart is still breaking over Marc. Suddenly she must make the most important decision of her entire life. Will it be the right one? Join Mickelle and Rebekka as they search for love and self-discovery. This tender story of heartbreak, healing, and faith is one you will not soon forget.